A Great Way to Save Energy and Money. Thinking about buying a Nest smart home device? Let Delcor Inc. help you get it installed! 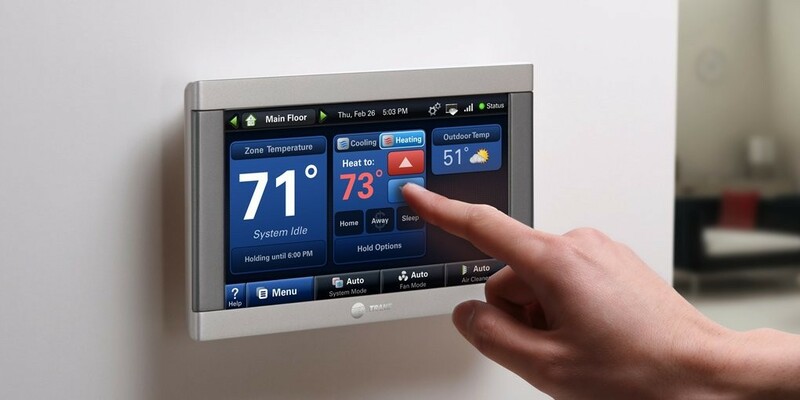 Delcor Inc., we install many different kinds of Nest equipment designed to keep you comfortable and help save energy. We find that all of the Nest products are top-of-the-line and their smart technology is user-friendly and can save homeowners, like you, a lot of money. The team at Delcor Inc. can help install your brand new Nest thermostat. Fill out the form below and one of our representatives will get back with you to schedule your install. Wait! Do you have a Trane unit? There are a lot of reasons to change out your thermostat. Two of the most common thermostats we install for our clients are the Nest Learning Thermostat and the Trane ComfortLink II. You have obviously already looked into replacing your thermostat and have already heard about the Nest Learning Thermostat. Another popular thermostat is the Trane ComfortLink II. To help you compare the two, we decided to put them head to head on a series of important factors. Click here to compare the Nest and the Trane ComfortLink II head to head.